3-Phase Transformers, essential components for lowering line voltages for all different applications, are one of our most frequently ordered products. 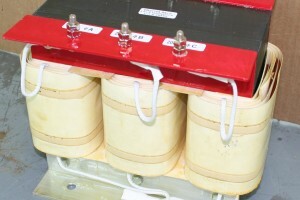 Step-Down Transformers reduce electrical voltage in an application. The 3-Phase design is more compact, cost-efficient, and lighter than three individual single-phase units used together. This design also promotes more efficient use of base materials, such as copper and iron ore.
At Agile Magnetics, we use 100% pure copper windings to construct our 3-Phase Step-Down Transformers. Designed for power ranging from 1VA to 75KVA, the transformers can take the available line voltage and step it down to what is required. When selecting the best transformer for their application, customers rely on our Agile Magnetics team for guidance; after assessing the specifications of their application, we develop a plan to design, manufacture, and deliver a custom transformer best suited for their needs. Each transformer meets the most stringent industry standards, and can be built to UL, CUL, VDE, and CE standards. With our state-of-the-art ISO 9001:2008 and AS9100 certified facility, we can accommodate orders of virtually any size or complexity. To learn more about our custom 3-Phase Step-Down Transformers, contact us today.